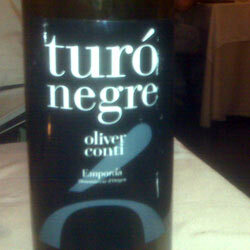 Oliver Conti county is a fine winery up in the Alt Empordà of Catalonia, Spain. We talk about them a great deal more in our Empordà wine guide, but suffice to say, you’ll more than likely fine their wines around all of Catalonia. Easy to drink, very food friendly, and well-priced, they’re quite popular in restaurants. Such was the case that I came across this bottle in an upscale tapas joint in the Eixample district of Barcelona. The wine was true to how it was when I tasted it in the winery: a good degree of acidity mixed with a loving dose of tobacco elements to make for a wine that was great with the meal while at the same time, not without character. The wines of Oliver Conti pretty much all stay true to this general paradigm and are most definitely worth checking out for those who want a reliable glass with their meal.